Being the front of house mix engineer for a variety of great performers is a real privilege but sometimes it also leads to other work. Howard Jones asked me to edit the footage from his gig at the IndigO2 back in November. It was a 9 camera shoot and a right mixed bag of cameras and codecs... XDCAM HD, XDCAM EX, AVCHD, Go Pro HD, Canon H.264... it took over a week just to convert all the footage to a common codec for editing... I've gone into this in a previous post. 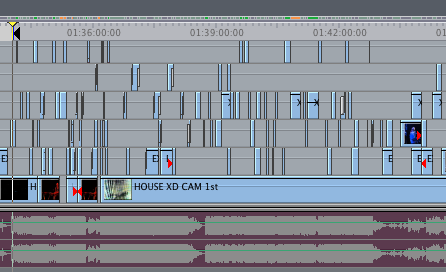 Now i'm halfway through the edit, i've got into a rhythm and it's coming together quicker. I considered using the multi-angle clip route, but have instead just plonked all the footage in a big stack in FCP and am ploughing through it that way. It took a good couple of days to get everything sync'ed properly, but it wasn't too hard. The difficulty with editing a concert DVD like this is finding the style. I get very bored watching edits where it's just cutting from one angle to the next...interspersed with long dissolves and the occasional wideshot.. it's tired and dull. I've decided to assign certain visual characteristics to certain cameras. The Go Pro cameras which are very uniquely positioned right up close to the performers are always either black and white and grainey or very bleached out colour.... i'm not using any 'normal' colouring on their shots. Any shot which has a big zoom in it...like suddenly closing in on Howard... that's black and white too. The graphics from the screen at the back of the stage are only overlayed onto the footage if there's a good reason for it... not the whole way through. There's one section where the whole song is in black and white apart from the motion graphics which are overlayed in deep, rich colours to frame the shot and give the monochrome look more definition. My way of working is simple, but a little long winded. I watch every single line from the song from each angle and pick the best one... sometimes i change angle every 4 bars, sometimes every 8 bars and sometimes i ignore the music and go right across the beat... if it works. Once i'm a 1/4 of the way into a song, it's usually developed a style of it's own which i then stick with for the rest of the song. Obviously, this is a live gig with a big audience, so i cut away to the audience sometimes, but not too much...i want this to be an experience to watch in it's own right, not just something to remember the gig by if you were there. 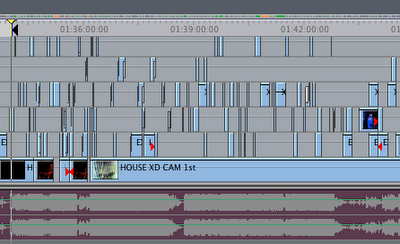 Here's how mad the timeline is looking... and this doesn't even show all the layers!